Gloves have been used in skiing and snowboarding since the inception of these sports. They’re not only a comfort item, but also important for safety and enjoyment, and you’ll be proverbially (or possibly, literally) lost on the mountain without them. While the gloves themselves are age-old, heated gloves are the newest and hottest (pun intended) thing on the market at the moment. The best heated gloves will usually try to achieve three main things: Heating hands, maintaining a compact form factor, and being easy to recharge after a day on the slopes. There are, however, many variations between pairs, ie. how long a charge lasts, which parts of the hands they heat, and so forth. We’ve rounded up 10 of our favourite choices of heated gloves for skiing and snowboarding, out of a list of over 30 gloves. We then reviewed them individually, as well as placing them in a handy comparison table. This makes it to easily identify their strengths and weaknesses over one another. TLDR: The Mount Tec Explorer 3 was our overall winner in this set of reviews. They’re made of the highest quality materials, durable, and are the best option we could find for rechargeable heated gloves. The Saviour Heated Gloves offer three separate heat settings, with a total battery life of 2.5 to 6 hours, depending on the temperature they are set to. The carbon fibre heating elements warm the length of each finger as well as the back of the hand, and while they don’t heat your palms, the glove has an external palm layer made of sheepskin which will help retain this heat within the glove. Aside from the palm, the glove is made from insulation cotton with a fleece liner and the heated layer in between. 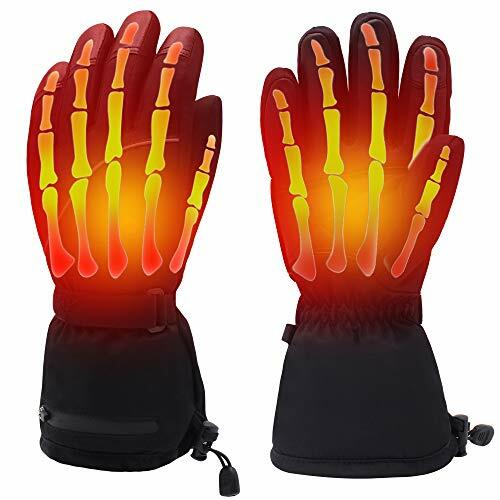 The gloves are durable, yet comfortable, and warm up in 30 seconds when the heat is switched on (by pressing the ON/OFF button on the outer hand). The Saviour gloves also feature a breathable membrane which prevents sweat buildup on the inside of the glove. The gloves arrive ready with a charging kit and are some of the best we could find on the market. They’re a solid pair of heated gloves that will last you seasons to come. The all-round winner in this category uses micro-composite fibre infrared heating to achieve up to 8 hours of heat time. Using Primaloft insulation and 3M scotchgard waterproof goatskin leather, the build quality on this pair of gloves is second to none. 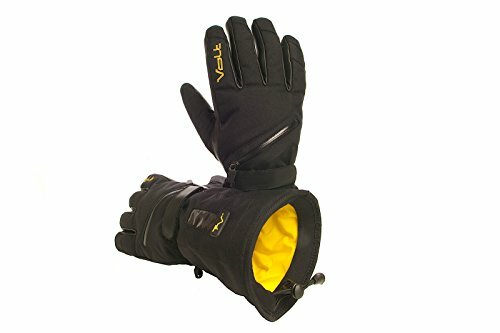 They’re touchscreen compatible and include all the features of a top-end ski glove, like waterproofing and breathability, a neoprene knuckle for flexibility, as well as three temperature settings and adjustable wrist and cuff straps to keep the snow, or any moisture out of your gloves. The gloves have three heat settings, which are all controlled by the ON/OFF switch and last for 4, 6 an 8 hours respectively. The battery can be recharged up to 500 times, and the gloves heat the palms of your hands, as well as the entirety of your fingers. They’re a quality build and product, and shouldn’t be overlooked when considering which rechargeable battery heated gloves to buy. The Alritz Battery Heated Gloves are a surprisingly cheap pair of very well rounded heated gloves. They also have three heat settings which last 4, 6 and 8 hours respectively, as well as housing a three-layer lining (heat layer, water-resistant layer, thermal fleece) for breathable waterproofing and windproofing. The gloves charge for 3-4 hours until full, after which they’re operated with a single button on the back of the hand. Made of a high-quality, stretchable 95% Polyester / 5% Spandex fabric, the gloves are flexible yet sturdy, and allow for easy hand movement, even with the battery packs in place. A filament on the thumb and index finger also allows for touchscreen capability, a handy extra. 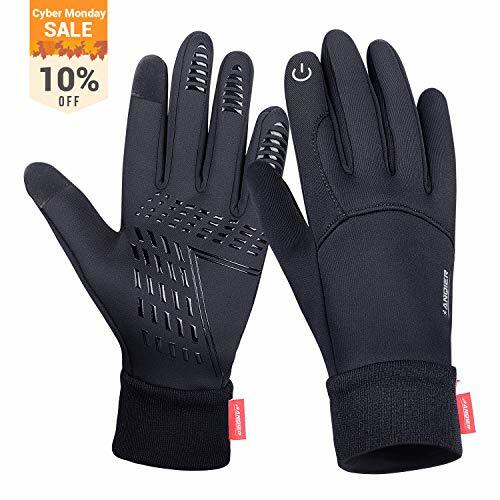 With heating elements on the fingers, palm and back of the hand, this is a nice, cheap, entry-level pair of heated gloves which are ideal for anyone seeking a starter pair. While the build quality might not be on par with some of the other brands listed here, they’ll do the trick and are a great choice for a pair to try out. 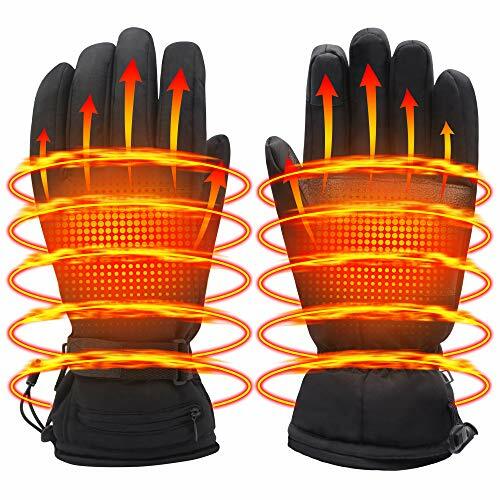 The Global Vasion gloves are a solid pair of electric heated gloves, and last between 2-5 hours depending on which of the three heat settings you’ve chosen. They’re reasonably priced, but this comes at the cost of a slightly less extreme build. The outer shell waterproofed, and combined with an 80% cotton / 20% sponge lining, the heat will stay within these gloves nicely. The heating element is, however, only found on the back of the hand, which might not be enough for some – but if you’re someone who found heated gloves too warm, this might be the pair for you. The gloves also don’t feature any touchscreen capability, but this isn’t something that everyone is looking for in a pair of gloves. While these gloves don’t have many bells and whistles, they have a strong build quality and durability. They are a nice, no-frills, entry-level option – perhaps for those entering less extreme weather, or for more general winter use. They’re a great choice for someone looking for a bare-minimum pair of heated gloves. The Heat Warmer gloves are a touchscreen-friendly, unisex pair of gloves offering 2-6 hours of battery life. 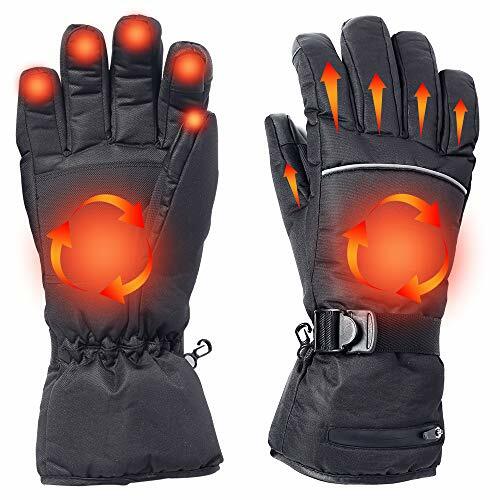 With an outer layer of waterproof fabric coating, and wear-resistant PU leather; as well as a wrist elastic and cuff tightener, this snug-fitting, durable pair of gloves is safe from the elements. The carbon fibre heating element warms the palm and small part of the fingers, adding rejuvenating warmth that increases mobility, and the spandex and cotton lining help retain that heat and keep it circulating. This is a very simple pair of gloves that offers two options for battery life, and no frills. The design and build leave a lot to be wished for, but the gloves do their job as far as heating is concerned. The Volt Tatra Heated Gloves are a high-end pair of heated gloves, ideal for someone looking to invest in a ‘lifetime pair’ of gloves. The reinforced leather palm keeps the glove comfortable and the grip strong, as well as helping retain heat within the gloves. The rest of the glove is made from heavy-duty nylon, and uses Volt’s Patented Zero-Layer Heat System, meaning it will keep your hands and fingers warm for hours. The gloves heat both sides of your hand as well as the length of your fingers. A 7-Volt Battery drives the heating element in the Zero-Layer Heat System throughout the entirety of your hand, even covering the fingertips, delivering equally spread and powerful heat throughout your hand for hours. 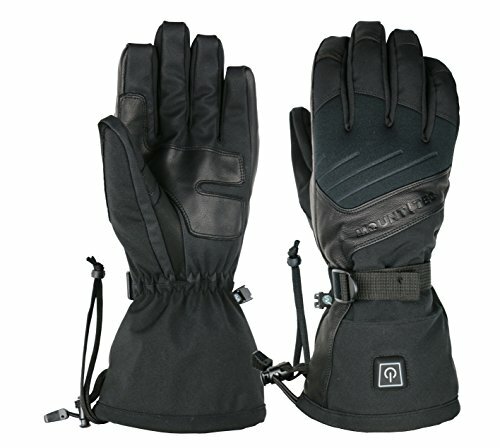 This is the pair of gloves for you if you’re looking for something sturdy and really well-made. It says a lot that this glove uses its own patented heating system, and while the battery life is only around 4 hours, this is one of the best heated ski gloves we could find. 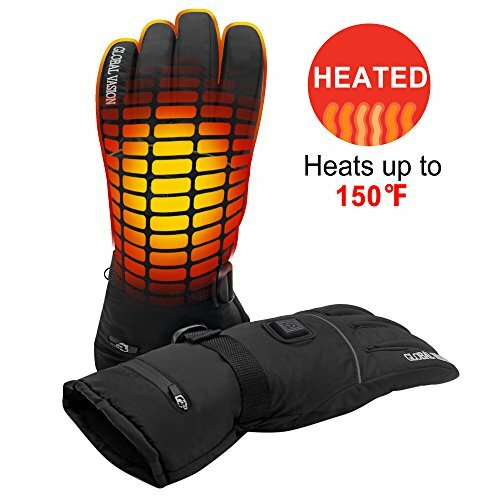 This pair of heated glove liners is a great choice if you’re not ready to commit to a full pair of heated gloves. It’s essentially a skintight glove that has a heating mechanism, over which you’d wear your regular ski gloves, and go about your business. It’s a bonus that you’re able to upgrade your ski gloves to a warmer pair and retain your heating mechanism. The glove liners are made from lycra, with neoprene on the inside and outside surfaces, layered with a cotton fleece. There are touchscreen-friendly fingertips on the index finger and thumb, and The heating element covers the back of the hand and fingers, and lasts between 2.5-6 hours. These are an essential just-in-case accessory for snowboarding, skiing, or any snow-based outdoor adventure. They will likely win you over if you’re not already sold on heated gloves, and are a treat to have waiting in your pack for when things get really, really cold. They make for great heated work gloves too. The Anqier Winter Gloves are somewhere between a heated glove and heated glove liner. You might not be able to fit an entire extra glove over them (it would really depend on the size of said glove). They’re a less-bulky option, perhaps for those with less extreme excursions planned, or those heading out in the warmer parts of winter. With touchscreen fingertips and an anti-skid silicon tread on the palm; and made from waterproof diving Lycra with a thick flocking design, these gloves are not only ultra-warm and waterproof, but comfortable and supple. This combination really makes them ideal for outdoor activities. 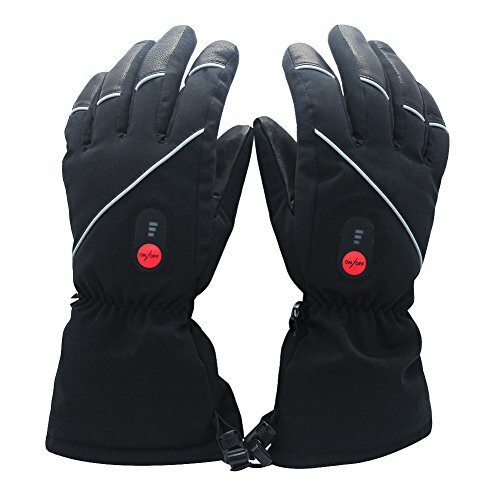 Combined with a very low price point, these make for a great low-intensity level pair of heated gloves. While they might not keep you warm in a blizzard, they’ll do a good bit of heating for a few hours out in the cold, and might even do a bit better used as a liner for your standard ski gloves. This high-end pair of glove liners comes with the same quality name as the Volt Tatra gloves. 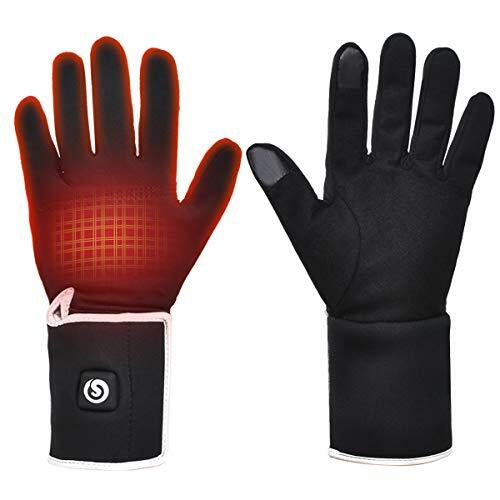 With a waterproof, breathable membrane; tech-touch fingertips for using touchscreen devices, and heating on both sides of the hand as well as down the length of the finger, these are essentially a full-on, quality heated glove that comes in the form factor of a glove liner. The gloves have a nylon outer shell, a soft tricot lining for easy heat transfer, and a waterproof and breathable membrane to keep the elements out. The glove is sturdy yet flexible, and while it’s a liner, the size can run a bit big, so you may need a larger glove than usual to wear over it. All in all, this is outright the highest quality heated liner we could find. Tough, durable and effective, it’s the cream of the crop as far as glove liners are concerned. The Autocastle Heated Gloves, made of cotton and spandex and featuring touchscreen-friendly fingertips, is a strong mid-range contender as far as this list of heated glove reviews goes. With two different battery options at two different price points, there’s room to choose. The batteries last 2-6 hours depending on which settings you have the gloves on, so if you’re looking for a longer warming duration then it’s best to keep the temperature low. These gloves don’t stand out particularly for any of their features, except that they absorb sweat and use quick drying technology – a feature many of the other pairs listed here could do well with. They also use an ultra-thin heating element for a compact form factor and slim design. The gloves mainly heat the palm, with a little of the finger, and do that job well – although the build quality and visual style leave room for improvement. There are a number of things that all of these gloves are doing differently, but the main factors to consider remain: heating time, and how much of the hand they heat. It’s all very well having a waterproof, windproof, touchscreen heated glove – but if they don’t heat your hands properly, they’re not doing their job, just like heated socks. After reading these heated ski glove reviews you should be more than well equipped to make a choice easily as to which glove you’d most like to go with. After all, rechargeable heated gloves may just be the future of snow-based activities. You might as well get ahead of the pack. If you’re looking for other items for a ski or snowboard trip, take a look at our ski trip packing list to see what you might be missing.